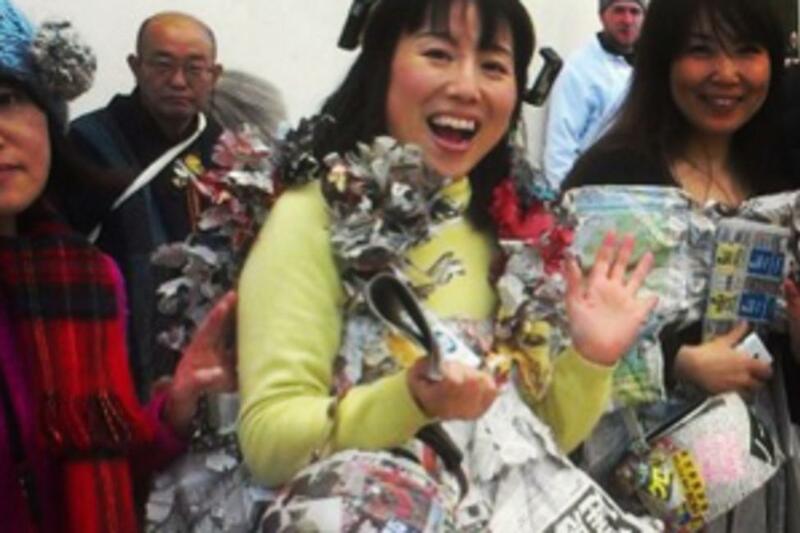 Japanese Artists Visit Lehigh Valley as Part of "Lollipop: Gutai Influences"
Three of the women, adorned in dresses made out of newspaper, entered Little Apple Market on N. 7th Street in Allentown. They made their way through the turnstile just inside the door, careful not to rip their newsprint and spotted a rack of coupon pamphlets. They stopped and noticed the paper coupon booklets were pretty much the same material as their dresses. So, they stopped, giggled, looked at each other and took a few copies. You know, in case they needed an emergency hem. The artists are just a few of 25 Japanese artists taking up residency in Allentown from February 10 to March 2 as part of the international art exchange entitled "Lollipop: Gutai Influences." The event is being coordinated by the great people at Fuse Art Infrastructure. According to a press release, the visiting artists are students and adherents of Gutai, an avant-garde movement rooted in antiestablishment sentiment that formed in Japan following World War II. According to founding member Jiro Yoshihara (1905–1972), a painter who wrote the Gutai Manifesto in 1956, a goal of Gutai is to explore the processes of damage, destruction, and decay to reveal the inner "life" of a given material or object. He also exhorted artists, “Don’t copy others!” and “Do something no one else has done!” which is the mantra of visiting artist Miyuki Nishizawa. The foray into the market on 7th Street in the afternoon was just one of the many the artists will be participating in throughout their stay. Shoppers checking their tomatoes were taken aback at first, but then immediately disarmed and charmed by the artists polite nature and smiles as they strolled the aisles. Some artists were amazed at the "high price" of fish in the market and "low price" of meat; the opposite occurs in Japan. Anyone who was in the market in a bad mood probably left with at least a slight smile on their face by the time the artists departed and made their way down 7th toward center city. To get in on the fun and see what all the hooplah is about take a peek at the list of "Lollipop" events going on this week.